Unity 2018.1 is now available! What’s new for developers? What’s new in Unity 2018.1? Unity 2018.1 is a major upgrade of the most popular game engine available for free. So many things are new in this version. It’s hard to describe everything in this single post. I’ll focus on what I use most for developing mobile games at Pinpin Team games studio. 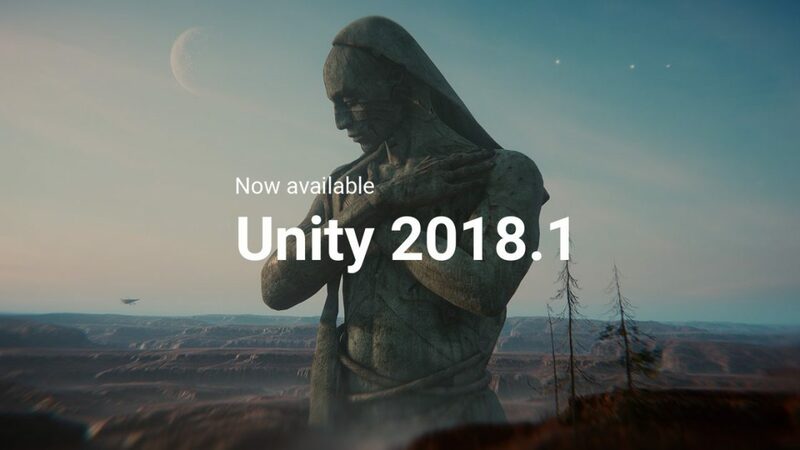 I advice you to check Unity official blog post Unity 2018.1 is now available to discover in detail every new features. Let’s start with the new rendering templates. You can now script via C# and material shader the render pipeline to create any effects you ever wanted. It’s now possible to create AAA games quality with Unity. If like me you prefer to focus on out of the box settings, templates are here for you. Unity provides different templates for different hardware. First of all the Hight End template targets… Hight End PC and consoles devices. Also, the Lightweight template targets lower-end hardware such as mobile, VR devices and finally less powerful consoles hardware. Shader Graph enables you to build your shaders visually using Unity 2018.1 editor. Instead of writing code, you create and connect nodes in a graph network. The result is immediately visible, making it simple for anyone to create a shader. These 3 pieces were missing from Unity since the beginning. ProBuilder was formerly available in the Assets Store. Now it’s available for free directly in Unity 2018.1 as a package. The first one is a tool to create 3D meshes. Already used Valve Hammer to create a level of Source Engine? ProBuilder is as easy to use. Because you can create 3D models without leaving Unity. Prototype level, create meshes, export them, import them. Also, apply textures and materials directly inside Unity. Using Unity primitive block was so frustrating when prototyping games. With ProBuilder forget about it and start enjoying level design inside Unity editor. As a result, you don’t need to create your own basic tools anymore. Another great tool is ProGrid. It’s a 3D visual grid system to snap model in your scene. It makes level creation really fast, easy and precise! Finally, Polybrush enables to blend textures and colors, sculpt meshes directly in the Unity editor. If you want to learn more, read this blog post about ProBuilder joining Unity team. What next for 2D games? As we seen before, ProBuilder is for 3D, SpriteShape is for 2D. It provides the ability to tile sprites along the path of a shape based on given angle ranges. Additionally, the shape can be filled with a tiling texture. If only we could have this tool when creating The King and the Salamander. At Pinpin Team we often created tools to edit level. But without the power of spline, we had to ordered sprites all around. Furthermore, 2D Animation System is a new tool for 2D animation. It’s not an integration of Anima2D in Unity 2018.1, it’s a brand new tool. 2D Animation System remind me of the UbiArt framework. I can’t wait to get the complete version. On my game Vikings: an Archer’s Journey we used Esoteric Software Spine to animate our characters. It’s a great tool but we get poor performances with some Android devices. I hope this tools will work smoothly with Unity. You can learn more about it on Unity forum post 2D Animation Preview Packages. In conclusion Unity 2018.1 has a lot’s of great new features. This game engine looks like more and more to Unreal Engine in term of rendering quality. Moreover, so many great tools are added directly to the editor. I’m waiting for the next releases and of course, for the nested prefab support as announced during GDC 2018 conference. It will be available in fall in Unity 2018.3. What’s your favorite feature available with Unity 2018.1?